So, I tried Indian food for the first time today. Where I work the IT group had a luncheon and had a bunch of left overs so they invited my department for lunch... I was pretty surprised how good it was. The pic does not look too appealing but it did taste good.... 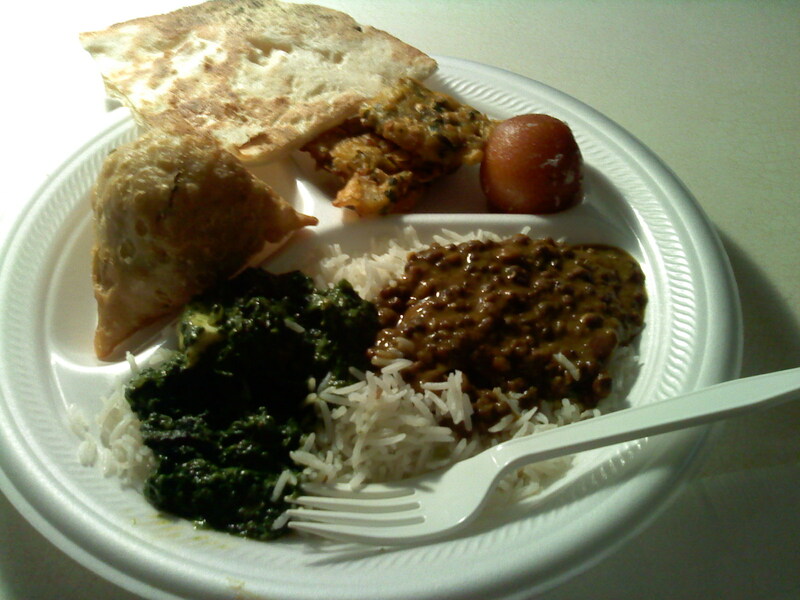 The bottom of my plate is a spinach curry with paneer and to the right of that are lentils, both on rice.. on the top right, I can't remember what it was called but it had peas and potatoes inside of it and was fried. naan bread in the middle, potato and spinach pancakes and the ball was dessert. It was dough with a honey sauce... pretty yummy.... I wish I knew the names of everything... My co worker who was telling me what everything was didn't know and was also scared of the lentils... I'll just say what my mom thinks refried beans look like, he said that is what the lentils reminded him of ;) Ok moving on! I think I might of opened a new book... I shouldn't have a problem finding ingredients around here, since there are 2 Indian grocery stores about 2 miles from where I live. Just a matter of finding good recipes! :) If anyone has any, please feel free to share!